I’m excited to cross one more thing off of my typical grocery/household spending list. Our family typically fills a dishwasher load every day and I usually run it every night. In the past, I’ve been a big fan of dishwasher tablets and have used them pretty faithfully. However, what I don’t dig is how much they end up costing me. 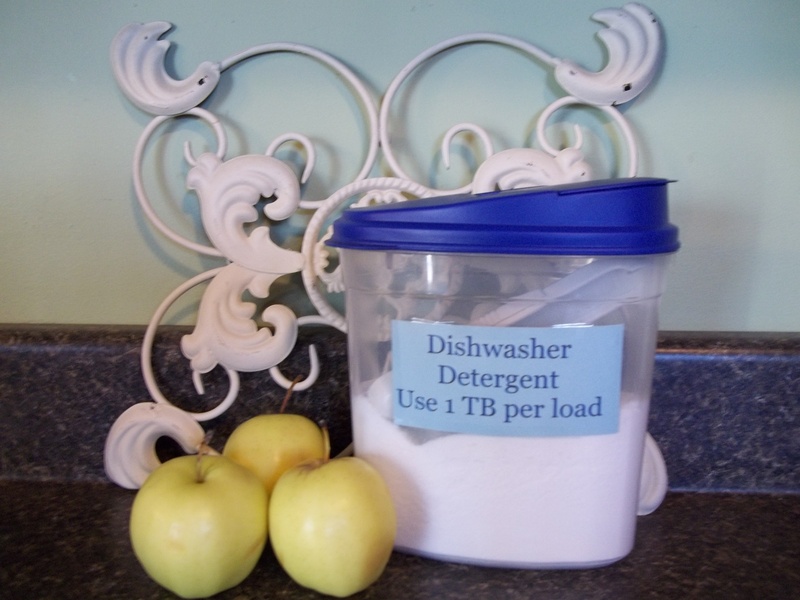 Since I discovered how cost-effective making your own laundry detergent is, I was on the hunt for a good dishwasher detergent recipe. I was ecstatic to find one that used a lot of the same ingredients as the laundry detergent recipe I use. Willing to at least give it a go, I made this recipe this past week and have been quite pleased with the results. Mix all ingredients thoroughly in a bowl and put in an airtight container. Use 1 TB per load. I also recommend using a shot of white vinegar as a rinse aid. It works great! This is great!! And so much better than all the chemicals in commercially prepared detergent! It is a good feeling to cross something off your shopping list! I made pita chips for the first time yesterday and I can’t imagine why I didn’t make my own sooner as they were super easy to make. 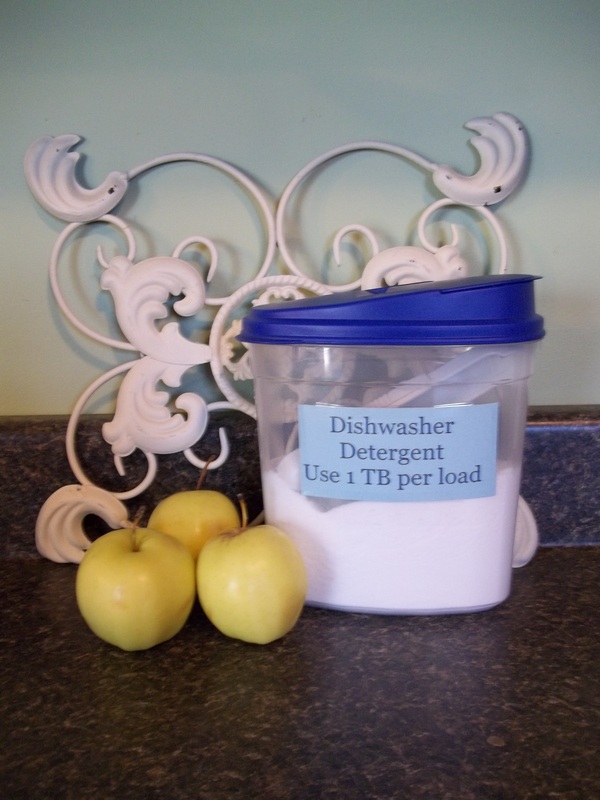 I’ve always wanted to make my own dishwasher detergent. This seems so easy! Where do you get the Borax and the citric acid? The citric acid is that lemon juice? Borax can be found at WalMart or other stores in the laundry aisle. Citric acid is a little trickier to find–some people use lemonade KoolAid because it contains a lot of citric acid. I just recommended to another reader that it can be found with canning supplies–I get mine at a local bulk foods store. It comes in a white powder form. I hope that helps! This is great. I already make my own fabric softener and laundry soap as well as vinegar based cleaners. This is the next logical step! Ironically I keep my baking soda in that very same container. Kerry, some people use packs of lemonade KoolAid because it contains lots of citric acid. I happen to get it at a local bulk foods store. You may also be able to find it in a store that carries canning supplies. I’m also wondering where you find citric acid and whether you put the vinegar in the rinse dispenser at the beginning of the load or what. Barb, I got the citric acid in the bulk foods/spices section at Maplehofe. Also, I put the vinegar in at the beginning, before I start a load. This looks easy enough! I’ve got to keep my eye out for the citric acid. Thank you so much for sharing at Taking A Timeout Thursday! Hope you had a wonderful Valentine’s Day! Great recipe, but does it really clean the dishes as well as say, Cascade compleete? We are dish scrapers, but not “wash dishes before they go in the dish washer” kind of people, and hubby gets super irritated when the dishes come out with food still stuck on them. We’ve resorted to buying the super expensive detergent because we think it’s worth it. What do you think? Thanks! Hi Rachel! I’m up late waiting to “skype” with my husband. Saw this homemade dishwashing recipe. It’s just like what I’ve been using, but with salt. Also, I add the citric acid in separately-was told it can cause the powder to clump when all mixed together-? Does yours clump? I’m due to make another batch & I’m going to add the salt. Occassionaly my mix has had some “mixed results”, so maybe the salt will be just what it needs for that extra kick! And the vinegar is just great for EVERYTHING! Love the natural cleaning products. 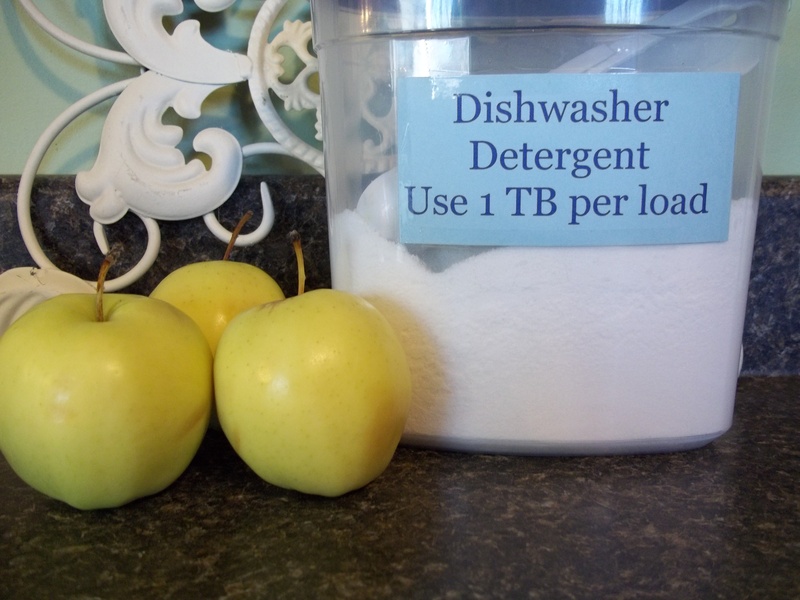 Still looking for a regular dish detergent recipe…have made a few, but nothing I like or that would be cost effective. Any suggestions? Celeste, I haven’t had much trouble with clumping. As for regular dish detergent, I tried a recipe recently and wasn’t impressed with the results. Dawn works the best for me! just came by to read this blog. It appears really informative and I liked reading it, thank you for the helpful information! Hi Rachel, I was looking for a diy dishwasher detergent on pinterest and happened to click on yours! I didn’t know it was you though! How funny 🙂 Can’t wait to try it!